What just happened? 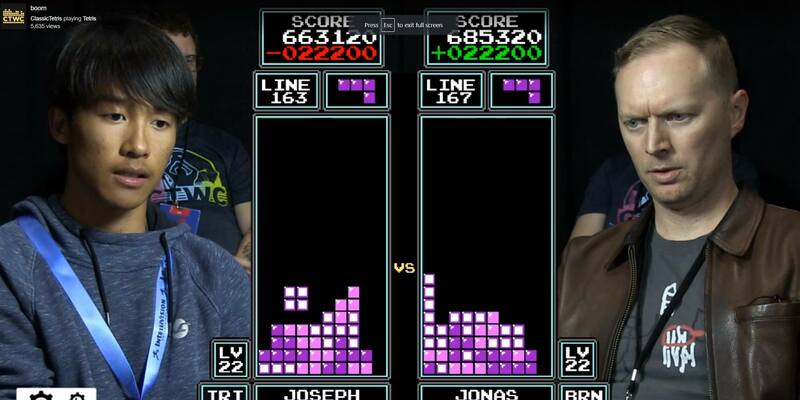 A lot of people think they’re pretty good at Tetris, but few can match the competitors from this year’s Classic Tetris World Championships. The event, which took place at the Portland Retro Gaming Expo, saw 16-year-old Joseph Saelee take the crown after beating the seven-time world champion. Saelee had to qualify for the competition and had a difficult battle against Japanese grand master Koryan in the semi-finals. He faced reigning champ Jonas Neubauer in the final, who had won seven out of the last eight previous world championships. Neubauer missed out on the top spot in 2014 when he came second to Harry Kong, the first ever person to reach the maximum score of 999,999 in NES Tetris. Players used their own unmodified NES controllers during the tournament. Rather than holding down the D-pad like most people, Saelee uses a “hypertapping” technique that involves tapping the pad as quickly as possible. Neubauer fell behind 0-2 in the series, and although he was 110,000 points ahead in the third game, Saelee was able to surpass his lead and win the title. While Saelee is quite new to the competitive Tetris field, he reached level 31 in the game, hitting 311 lines, just weeks before the competition—an amazing feat that you can see below. Winning the championships is an incredible achievement for Saelee, who is 13 years younger than NES Tetris. He walked away with the $1000 top prize yesterday, and will likely be the one to beat for many years to come.